Create a calming environment that supports your patients' recovery! Whether you operate a clinic, a medical service center, a dentist or optometrist office, a physical therapist, a sports rehab, a health care center, or a hospital, you need to have signs and graphics. How can they help? Signs and graphics are essential tools that help health care services create a supportive environment for their patients. RainMaker Signs offers a wide variety of visual communication that aligns with Health Care service providers' needs and goals. We tailor services to ensure our clients get signs and graphics they feel satisfied with and align with their business goals. 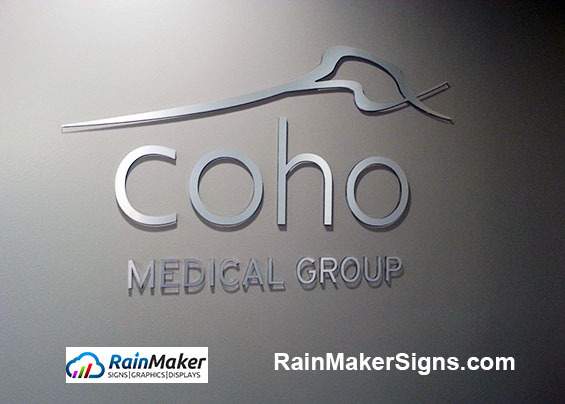 The goal of RainMaker Signs' signs and graphics is to facilitate health care services, such as hospitals, dental clinics, chiropractors, etc., to offer the most caring healing environment. Professionalism Signs, graphics, and displays are ideal visual communications that inform patients and their families about the doctor's practice and achievements. Credibility Showcasing success stories and testimonials instill confidence in both old and new patients and give them hope on recovering. Patient Care Health care services can present their services with bold graphics. This enables patients to better understand how the facility aligns with their needs. Atmosphere Special designed signs and graphics can create a calming and soothing environment that helps with patient recuperation. Guidance It is important for signs and graphics to point directions and give names to places. Confusing signs add frustrations to patient's' health care experiences. Advertising Whenever health care services have any promotion needs, banners, graphics, and display signs are some of the most effective channels that spread the news. Design, material selection, installation location, permitting, RainMaker Signs' sign experts will plan with you and ensure every tasks are on track. RainMaker Signs' designers can trasnform your concept incorporating your branding into mock-ups that enable you to envision the finished effect. If you have several locations that need signs and graphics, we can manage that for you without your need to repeat the process with the local sign studios. Clinic signs, hospital graphics, dentistry displays - all aim to create soothing health care experiences!